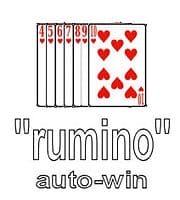 Rumino, ramino, rumina, is a knock rummy card game of Italian origin played up to 6 players in which players try to form sets or sequences of cards. It may possibly have been devised in American during the 1940s by Italian immigrants by adapting the game Scala Quaranta to Gin rummy. It is usually played for small stakes Two 52-card decks are used plus four Jokers comprising 108 cards. The aim of the game is to push the players over 100 points and keep a score low. All players draws a card from the deck, and the high card determines the dealer. Subsequent deals are passed to the left. Each player is dealt 7 cards, and the remaining stock pile is spread on the table. The top card of the deck is then turned face up to start the discard pile, and the player to the left of the dealer draws the top card from the stock pile or discard pile to make combinations of three or four-card "lays", e.g. Three of a kind, Four of a kind, a three straight flush or a four card straight flush. Aces can only be played Low and Jokers are wild. After a card is drawn, one must be discarded, and the next player to the left has the option of drawing either the top discard or top stock card, then he must discard. Extra unused cards in the players hand are points, and they can knock when it's their turn with 7 or less points. In lieu of drawing, and stop the current hand, every one shows their hand at the time and adds up their points. "Lays" count as 0 and unusable deadwood cards are "points". Face cards and Jokers count as 10, Aces are 1, and other cards are index value. Players cannot close or knock before one rotation is completed. If the player draws a lay of 4 and a lay of 3, meaning that he is using all 7 cards, he can announce "gin" (also known as "ten less"), the hand immediately stops and he is scored -10 points. Other players are stuck with whatever unusable points they have in their hand. If a player hits "gin" for the 1st three consecutive hands to begin a game, they automatically win. If the player draws a 7 card straight flush or 7 of a kind, he announces "rumino". The game stops and the player wins the game outright. If he holds 6 cards to "rumino" and another player discards the card that he needs, he may pick it up even if it is not his turn. When a player gets to over 100 points, he is eliminated from the game, but can rebuy back in for the highest score if he wishes, as long as there are at least two other players left. No Rebuys are allowed if "rumino" is hit, or when the hand started as heads-up. Every time a certain player rebuys, the stake for that player doubles. In a $10 game, for instance, the first time a player rebuys it's $10, the 2nd $20 and so on. When only one person is left with 100 pts or less, or someone hits "rumino", they are the winner, and are awarded all the money in the pool. If a new game is played, winner deals the 1st hand.